One night many years ago, I was driving home after anchoring the 10pm newscast… when I got stuck behind a VERY SLOW car. I was highly annoyed. I was exhausted and just wanted to get home and climb into bed. The driver in front of me wasn’t paying attention to the 30 mph speed limit… the car was only going about 20mph— max. I was forced to stay behind the car for only three blocks before it turned onto a side street— but it seemed like an eternity. 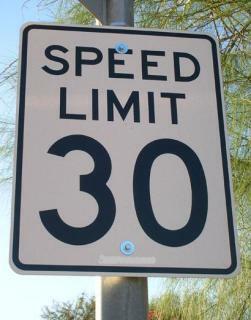 I quickly sped back up to 30. About a block after I reached the speed limit, I looked ahead to the next intersection and saw a huge SUV (without its lights on) ignore a stop sign and go screaming across the road. It was going so fast, I couldn’t even tell what color it was. It was just a blur. I felt the blood drain from my face as I realized… if I hadn’t gotten “stuck” behind that slow car for three blocks, I would have reached that intersection right around the time that SUV went plowing through it. I would never have seen it coming because the lights weren’t on. And I would have been broadsided by 3-ton hunk of metal going at least 60 mph. Even if I’d managed to survive, I was about three months pregnant at that time. All of a sudden, I had much greater appreciation for the driver of that slow car. That incident also caused me to think. Sometimes what we want isn’t necessarily what we really need. I really wanted to be able to drive faster so I could get home quickly that night. But if I’d gotten what I wanted, I might not be around to write this blog right now. How many times have I really wanted something… and been frustrated when it didn’t happen? And how many of those times did I not realize that what I wanted wasn’t necessarily what I needed? At least not at that moment. Applying that theory to life, personal experience has taught me that when I encounter many, many barriers on one path… there’s usually some reason for those barriers. I’m fully willing to admit that when those barriers actually present themselves— I don’t really care what the reasons are. I get frustrated. I get sad. I get angry. And once upon a time, I used to stay stuck in those negative moods for a LONG time. In any case, I’ve discovered that by the time I find myself heading in a better direction, I have a greater appreciation for the barrier that sent me on the detour in the first place. Just like I had a greater appreciation for that slow driver. The wait can be maddening, but it also might be for our own good. Sometimes we just aren’t as ready as we think we are. Sometimes we need to grow or learn certain lessons before we get it. Sometimes it’s just a matter of gaining a greater appreciation for what we want. Or giving ourselves enough time to realize that what we THINK we want isn’t necessarily what we REALLY want. Or perhaps when we first want it, it’s not something we necessarily would appreciate fully at that time. Once we appreciate it more, we are more likely to cherish it forever.